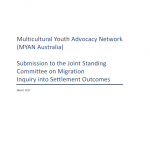 MYAN has released a 2019 Federal Election Policy Platform identifying eight priority areas for young people from refugee and migrant backgrounds. MYAN believes that all candidates in this election have a responsibility to lead with innovative and concrete policies that ensure young people can unlock opportunities that lead to full participation in Australian society. This Election Platform uses the National Youth Settlement Framework as a basis for highlighting what the Federal Government can do to enable the active and sustained participation of young people in Australian society – by investing in programs and strategies that advance a strong, cohesive multicultural community. We are calling for targeted approaches in policy and service delivery in eight key areas: Education and Training, Employment, English Language Learning, Settlement Support, Housing, Participation and Inclusion, Health and Welll Being and Asylum Seekers and TPVs. Targeted approaches are essential to supporting the active social, cultural and economic participation of young people from refugee and migrant backgrounds in Australian society. 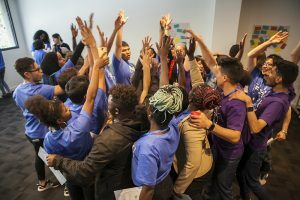 Programs focused on young people from refugee and migrant backgrounds in isolation however will not address structural barriers to participation. MYAN is calling for more attention to policies and strategies that address disadvantage and promote social cohesion through better access to education, employment, health and housing services, opportunities for civic and social participation and leadership, and stronger, more coordinated youth settlement support. “We don’t want young people from refugee and migrant backgrounds to be left behind. Careful investment and nurturing is required to continue to build and maintain Australia as a successful multicultural society – one that affords all its members opportunities to participate fully and meaningfully”, says Carmel Guerra, Chair of MYAN. Read MYAN’s full Election Platform here. Read MYAN’s summary Election Platform here.